This symmetric ANKY® bridle is made of the finest English leather. Its anatomically shaped headpiece features soft leather padding and provides extra freedom behind the horse’s ears thanks to its round shape. The bridle has a narrow, curved browband with shiny synthetic gemstones in two sizes, which are set in firmly-fixed rivets. The browband features soft leather facing. The throatlash can be adjusted on both sides and the cheekpieces are fitted with hook stud billets. 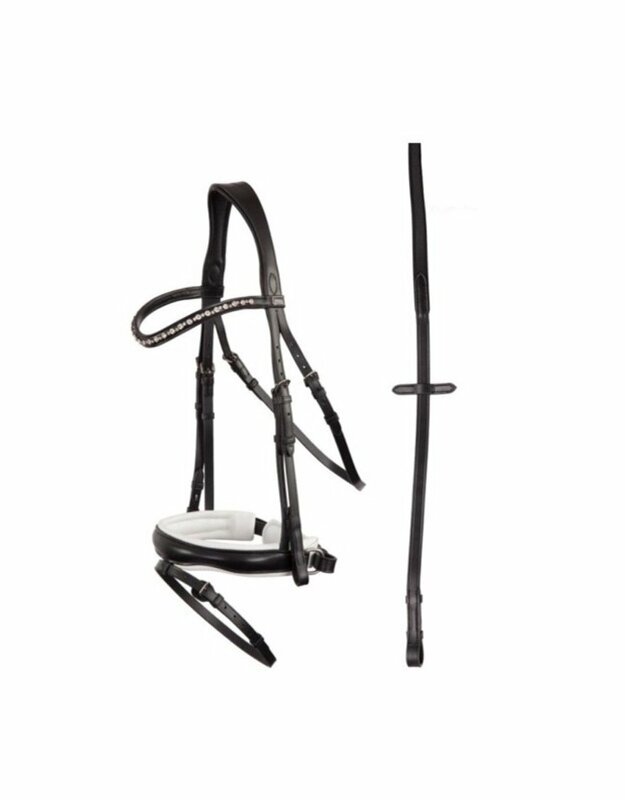 The bridle has a wide, crank flash noseband (approx. 4.4 cm). The noseband is round raised, softly padded and equipped with a wide chin pad. The flash attachment is shaped like a V and the flash strap buckle features a protection flap. The bridle features shiny, silver-coloured fittings made of chrome-plated brass and comes with web grip reins (20 mm wide) with rein stops. The reins are woven through with rubber for additional grip.